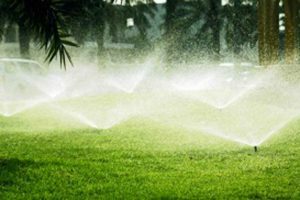 Your home’s lawn and garden have very particular irrigation needs that are best met using diverse approaches. For large, flat areas a sprinkler system is better suited. For precise watering, however, a drip irrigation system is more efficient. The type of lawn you have will determine the irrigation system you need. Of course, both have benefits and disadvantages. You should consider both. An underground irrigation system, or a sprinkler irrigation system, is the most common form. An underground system is designed to use large volumes of water across a vast area – ideal for large homes. The buried water lines ensure a lawn mower does not strike the system. When combined with timers, the system becomes fully automated and easy to use. On the downside, however, the sprinklers must be placed above ground to efficiently water plants and grass. This means they pose a hazard to lawnmowers and landscaping techniques. You’ll need to be careful. A drip irrigation system is designed to deliver a specified amount of water to a small area. A professionally installed system should deliver the water directly to the soil near the roots. It’s a slow process, though. Very little water is lost due to evaporation or runoff, thankfully. Using a water meter in conjunction with a drip irrigation system offers automatic watering with precise timing. On the other hand, a drip system presents a tripping hazard and limits use of a lawnmower or trimmer. The reason for this is because the system rests at the top of the ground. Most irrigation systems have this downside, though. For irrigation system installation, contact Blooms Landcare for professional service. You can reach our offices at (817) 688-5352. We’re happy to answer any questions you may have regarding proper irrigation for your lawn and garden!